Deriving from the Sansakrit language, the word “Songkran“ means to pass or to move into. In this context, the meaning implies to the passing and the moving of the sun, the moon and the other planets into one of the zodiacal orbit. 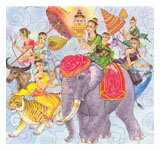 And the Grand Songkran Festival which falls on the Aries indicates the new era of the Thai New Year. Owing to the ancient Indian belief, the Grand Songkran Festival is most appropriate to be the Thai New Year due to the timing of the best season which is known as the spring of India which comes right after the cold season of winter. Also, there are other aspects supporting this belief such as the blooming flowers, the fresh atmosphere of the nature and the livelihood of all the living creatures. With the great influence from the Indians, the Songkran Festival portrays the typical ways of life of the Thais which involve the agricultural aspects. Free from their regular routine work, the Thai citizens will find time to perform their annual rites of showing respect to their ancestors. The highlight of the festival will include the younger Thais paying respect to their elders by sprinkling their hands with scented water. And in order to welcome the New Year, the celebration will include the delighted colourful local entertainment which, in fact, suitably unite the mutual relationship between members of the family, the society, the nature and surrounding. Therefore, this Songkran Festival has proved to be the most important and grandest festival of the year. Moreover, our neighbouring countries such as Myanmar, Cambodia and Laos have also organised this type of festival. Since the old days during the Sukhothai period, the Songkran Festival had been practised both in the royal court palace and among the ordinary citizens. However, the size of the celebration had not been as elaborated as of today. Back in those days, civil servants and other government officials would pay homage to the king, and would drink the oath of allegiance to the king or the government, while the king would provide annual salary to all officials. Later on in Ayutthaya period, the festival had been expanded by including the bathing of the Buddha image. Also, the festivities would include the forming of sand pagodas and entertaining celebrations. In the Rattanakosin period, the rituals had been conducted in the similar pattern as those during the Ayutthaya period. Songkran Festival, April 12-15, is the traditional Thai New Year. This is the time for Thais to pay homage to Buddha images, clean their houses, and sprinkle water on their elders in a show of respect. Anyone who ventures out on the streets is likely to get a thorough dousing of water, all in good fun, but also quite welcome at the peak of the hot season. The festivities at school started with a small sketch to show the students the real meaning behind Songkran. In the picture to the left, a "daughter" is sprinkling water over the hands of her "parents" in order to show respect. Afterwards, the students lined up to pay respects to the Buddha image and then to the teachers by pouring rose scented water over their hands. Even the teachers took part in the ceremony. During Songkran, all of the offices and schools were closed and people celebrated for almost a week in some places. Many of our students went out on the back of pick-up trucks armed with buckets of water and water guns. Others stationed themselves on strategic intersections in order to douse motorcyclists or any motorist with their windows wound down. No-one complained about getting wet as April is very hot.